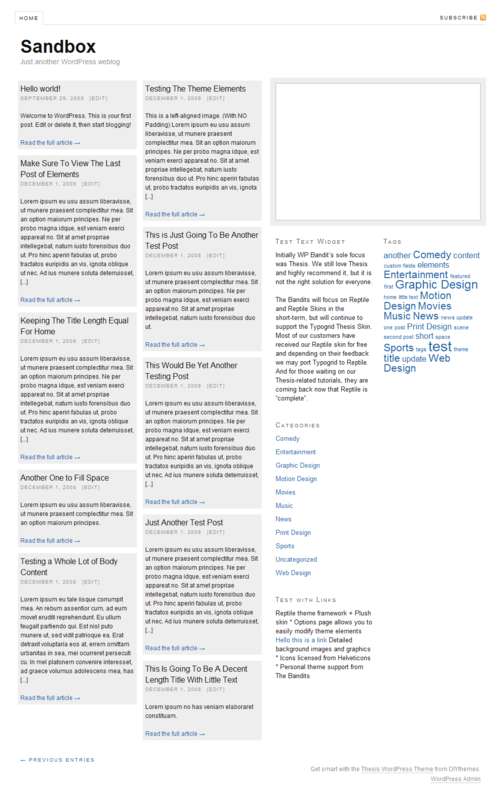 The Masonry effect has become popular among different web sites to achieve a unique layout. Using the jQuery Masonry code, I’ll show you how to get this effect with Thesis teasers. First, you’ll need to download the jQuery code and move it to your site. Download it here and move it to a new folder in your Thesis custom folder, called scripts. Make sure the file has the .js extension and not a .txt or .htm extension. In order for this to work you’ll have to disable featured posts and use teasers. 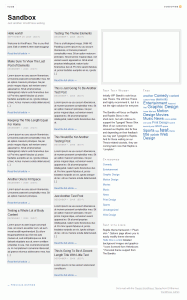 Go to your WP Dashboard and to your Thesis Design Options. Find Featured & Teasers and change the value to 0. You’ll probably also want to make a few other changes in Thesis Options (if you haven’t already have it set this way). Under Site Layout, change the HTML Framework to Full-width framework and drop down Body (and Content Area) and uncheck Show interior layout borders. At this point the code is in place and your teasers will be Masonry-ed, however they probably don’t look the best so we’ll look at styling them. Click above for a larger shot. What this CSS code does is simply adds some spacing background around each teaser and fixes the previous/next post navigation. Now you should see the final product, similar to the attached screenshot. It doesn’t end here though- the Masonry plugin is very powerful and can do much, much more then just stylishly line up your teasers. 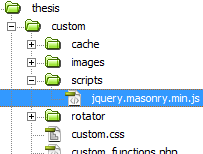 Check out the documents and demos to see the full effect of Masonry and try something new with your Thesis site.